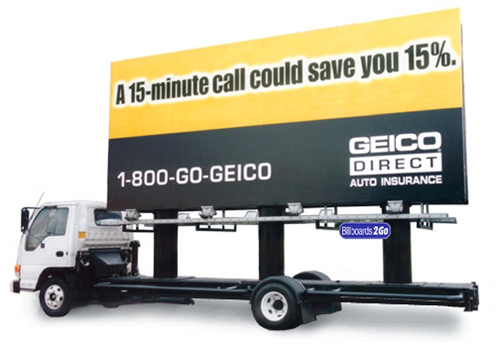 The Billboards2Go.com mobile billboard media team works with a wide variety of businesses from small to Fortune 500. Our clients are as varied as their needs. We specialize in advertising exposure for the following categories: Advocacy, Automotive, Banks, Entertainment (TV Shows & Movies ) Insurance, Retail Electronics, Fashion, Furniture, Sporting Goods, Sports Teams, Supermarkets, Family Attractions, Healthcare, Parades, Political Campaigns, Public Service Announcements, Real Estate, Restaurants, Special Events, Telecommunications, and Tourism. – Please take a look at our gallery page to see how we helped some of our clients achieve their media exposure goals.